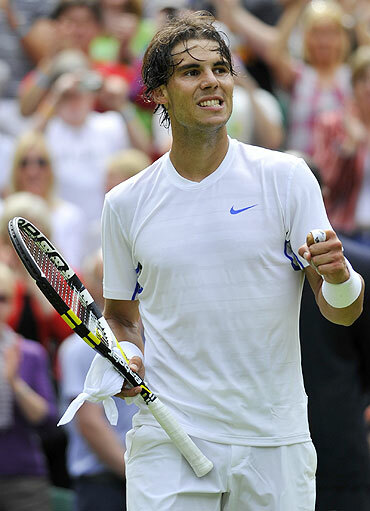 Rafa Nadal made a dazzling start to his Wimbledon title defence with an easy win over American Michael Russell on Monday before home favourite Andy Murray produced some indoor fireworks to join the Spaniard in the second round. World number one Nadal, playing at the grasscourt slam for the first time as defending champion after injury denied him the honour in 2009, beat Russell 6-4, 6-2, 6-2 after taking a few games to get to grips with the 33-year-old journeyman. Nadal, bidding to equal Bjorn Borg's feat of winning the French Open and Wimbledon in the same year three times, fell 4-2 behind against the 33-year-old Russell before finding his range on his forehand and racing into the second round where he will face American Ryan Sweeting. 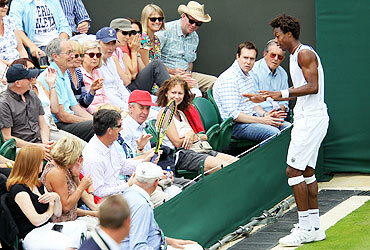 Nadal had his parents watching from the Royal Box as he won an entertaining tussle. "Was a big emotion to be the first player to play in this fabulous court," Nadal told reporters. "So seriously it was a very, very exciting feeling. 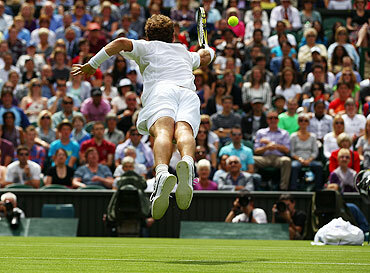 It was fantastic to see how the court is in really perfect conditions." The diminutive Russell has plied his trade on the lower echelons of the men's tour since 1998 and had only made the second round in 22 previous Grand Slam appearances. Yet for six games the Houston-based hustler was the equal of a player with 10 Grand Slam titles. Russell, ranked 90, missed a break point on Nadal's second service game but did break to lead 4-2. Any repeat of last year's opening day thriller when six-times champion Roger Federer almost fell to Colombia's Alejandro Falla never looked likely, however, as Nadal began pounding winners past the scrambling American who delighted the 15,000 crowd with spectacular tumbles and cheeky drop shots. It was the perfect two-hour workout for Nadal who looked revived after a brief break in Mallorca but tougher tests loom. After heavy rain shut down play on the 17 courts not equipped with a roof, Murray made full use of Centre Court's translucent sliding canopy to give British fans some cheer despite a scare against Spain's Daniel Gimeno-Traver. World number four Murray, who beat Stanislas Wawrinka in the only other whole Wimbledon match to be played under the 80-million pound roof in 2009, reeled off the last 15 games to win 4-6, 6-3, 6-0, 6-0. Murray's test against Gimeno-Traver could hold him in good stead as he aims to become Britain's first male Grand Slam champion since 1936. In front of a surprising amount of empty seats, Murray was initially caught cold by an opponent playing inspired "indoor" tennis to take the opening set. At 3-3 in the second set the outcome of the match was still far from certain before fourth seed Murray suddenly moved up a level to produce some exhibition tennis. 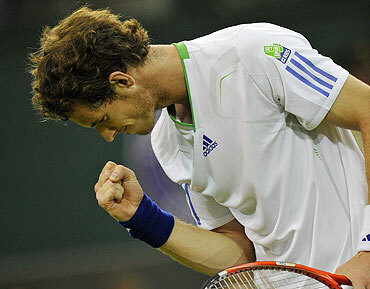 "It's like almost too perfect," said Murray who romped through the final two sets in 46 minutes. "There's obviously no wind, no sun, no elements to contend with. It's a different kind of grasscourt tennis." 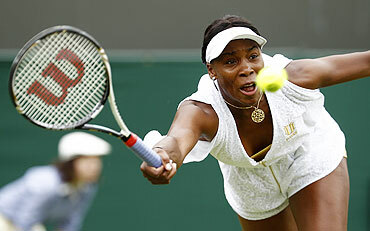 Before the rain clouds rolled over south west London five-times women's champion Venus Williams powered past Uzbekistan's Akgul Amanmuradova 6-3, 6-1 wearing her latest line in tennis fashion, a baggy ensemble with a large upside down V-shaped opening slashed in the back. The 31-year-old, who returned from a five-month injury lay-off at Eastbourne last week, struck the ball with her customary power to overwhelm the 97th-ranked Amanmuradova who is still looking for her first Wimbledon win after five attempts. "Especially having not played a lot, I had a little pressure on me to come out and swing as usual," Williams, one of the oldest players in the women's draw, told reporters. The American will have youth on her side in the second round, though, when she plays Japan's Kimiko Date-Krumm who beat British wildcard Katie O'Brien 6-0, 7-5. 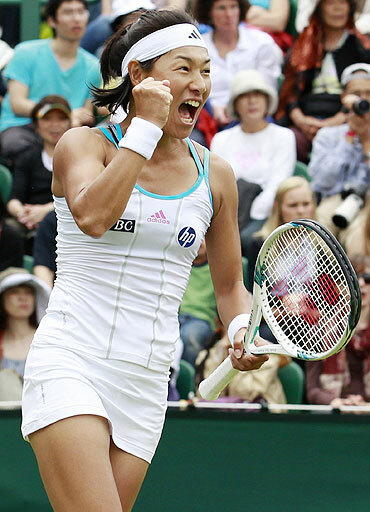 At 40 years and eight months, Date-Krumm became the second oldest player to win a singles match at Wimbledon since Martina Navratilova survived a round in 2004 aged 47. Vera Zvonareva, the highest-ranked woman playing on opening day, survived a big scare when the second-seeded Russian beat American Alison Riske 6-0, 3-6, 6-3 and last year's French Open champion Francesca Schiavone also needed a decider to see off Jelena Dokic in a match completed under the roof. Canada's fast-rising 31st seed Milos Raonic, a potential third-round opponent for Nadal, fired down 25 aces to beat Frenchman Marc Gicquel 6-3, 7-6, 6-3 and Czech Tomas Berdych, runner-up last year, crushed Italy's Filippo Volandri. Ninth seed Gael Monfils beat Germany's Matthias Bachinger in straight sets and he was joined in the second round by fellow Frenchman and former semi-finalist Richard Gasquet. Three-times runner-up Andy Roddick got no further than the knock-up against Andreas Beck on Court One before the rain arrived but fellow American Mardy Fish, the 10th seed, got though against Spain's Marcel Granollers.